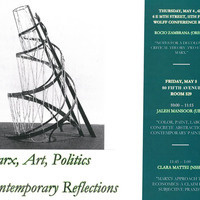 "Notes for a Decolonial Critical Theory: Two Uses of Marx"
"Color,Paint,Labor:Concrete Abstraction In Contemporary Painting"
"Marx's Approach to Economics: A Claim For Subjective Praxis"
"Late Style,First Art: The Fates And Politics Of Modernism"
"Forgetting The Factory: Work on Film"
Sposored by: The Robert L. Heilbroner Center for Capitalism Studies and the Department of Philosophy. Professor Cinzia Arruzza and Professor Paul Kottman, co-organizers. This is a two day event. Please note the different locations and the updated location for May 5th. May 5th event location is at 80 5 Avenue Room G529.